People all around the world are at this moment raving about a new technology by Yahoo! called Pipes. I guess it is kind of a portal builder which gets its data from Atom and RSS feeds. 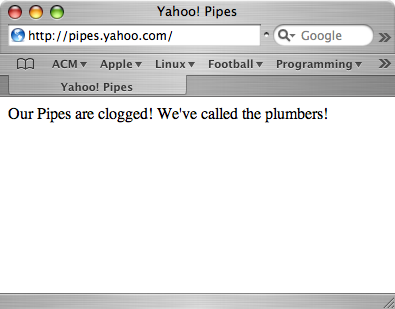 it could be that their pipes are really clogged. and people have over-hyped the news. It’s a great way to play with the feeds. Instead of having hundreds separate ones, all I’ll need is to pipe them into a single one and have it delivered nicely in RSS/atom form. It does great things in pulling stuffs from various sources like Flickr too. I tried playing with it but it’s a bit complicated and I don’t think everybody would be keen in trying that out. Have you? I think the fun gonna spread since you can share your creation with others, the different mixtures you did with the sources of info.